No, this is not P.F. Chang's but it's pretty darn close! These are REALLY good and good for you. Slice chicken into small pieces and cook with peanut oil over medium heat until cooked through. In a blender or food processor chop mushrooms, onion, and cucumber/ water chestnuts. Add chopped vegetables to skillet with chicken. Shred carrots and add to pan. Cook over medium heat for about 3 minutes. In a separate dish, combine rice vinegar, Soyaki, soy sauce, red pepper flakes and garlic powder. Stir or blend until combined. Pour sauce over chicken and vegetable mixture, stir and reduce heat to low. Let simmer for a few minutes. Wash and separate lettuce cups. 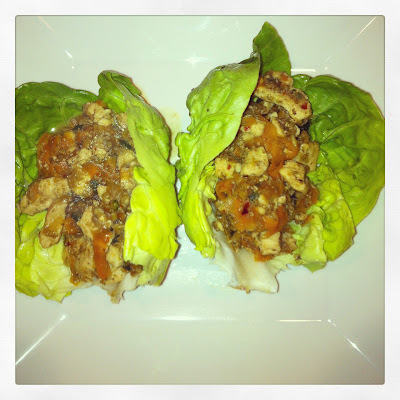 Spoon chicken mixture into individual lettuce cups and enjoy!